The brown paper in the windows is gone, and "Finest Foods & Subs" looks ready to go is open for business at the southeast corner of Lawrence and Sheridan. 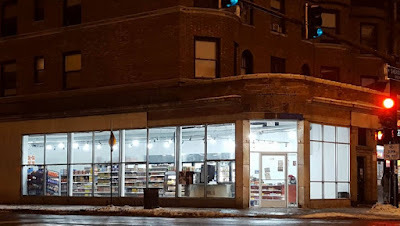 This store takes over the the site of the former S&L Pantry, which closed in August 2015. Rumor has it that the owners of Finest Foods are relatives of the S&L Pantry proprietors. Great, just what the neighborhood needs most: Another freaking convenience store. It joins the other several thousand already in Uptown. Wish it could have become a bar--but I know, too close to the Preston Bradley center. So if they're related to the former owners of the old establishment.. does that mean the same lack of good quality will occur with this new store? We don't have a crystal ball, but we hope it ends up being an asset to our community. I'll give it a fair shot at being a quality establishment. Short of carrying specialty goods & making killer subs this will turn out to be nothing more than a minor upgrade. That said, it's better than another empty storefront. I don't understand why it took from August to now for it to open when nothing really looks different. I'd love to have a sandwich place in the neighborhood. The shelves look to be nicely stocked however the walls and overall look of the place is pretty depressing. I hope they spruce it up a bit. That said, it's just down the street from the Lawrence House so here's hoping they do brisk business and stick around.